In what has become an annual ritual, Bloomberg administration officials trumpeted the flawed results of their flawed street homelessness survey to claim that the number of unsheltered homeless people has declined — all the time ignoring indisputable City data showing all-time record NYC homelessness. Yesterday the City announced the results of its HOPE survey, a Federally-mandated annual effort to estimate the size of the unsheltered homeless population. The survey has been widely criticized by Coalition for the Homeless and academic experts as deeply flawed, and for six years has produced estimates that persistently understate the true scale of street homelessness in New York City. This year’s estimate — claiming an impossible-to-swallow 15 percent decline in the street homeless population — is even harder to believe than usual given the indisputable City data, detailed in our recent “State of the Homeless 2011” report, showing all-time record homelessness in New York City. News coverage of this year’s announcement was fairly muted, with reports by WNYC News, NY1 News, the Wall Street Journal (subscription required), and the Associated Press. The Coalition’s executive director, Mary Brosnahan, issued a statement copied below. And you can see a detailed analysis of the flaws in the City’s survey here. “Flawed surveys will give you flawed data. By only counting homeless people found in visible areas on a single bitterly-cold night, the City’s HOPE survey method is a notoriously inaccurate tool to measure homelessness. It is more likely that the City did a 15% worse job in counting than that there’s been a meaningful decline in the homeless population. “The much more accurate data — the City’s own statistics on the number of people in shelters — paint a different picture. 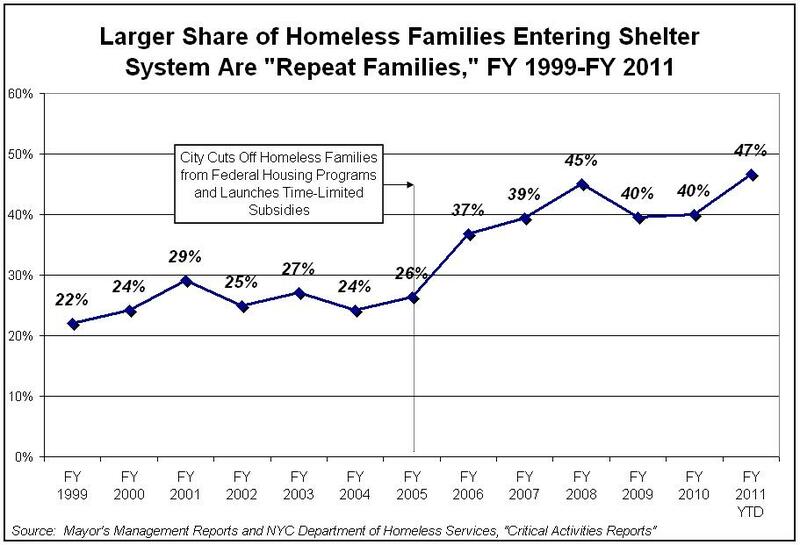 More people slept in New York City homeless shelters in 2010 than any other year on record. The all-time single-night shelter record was broken in February, with nearly 40,000 New Yorkers sleeping each night in city shelters. 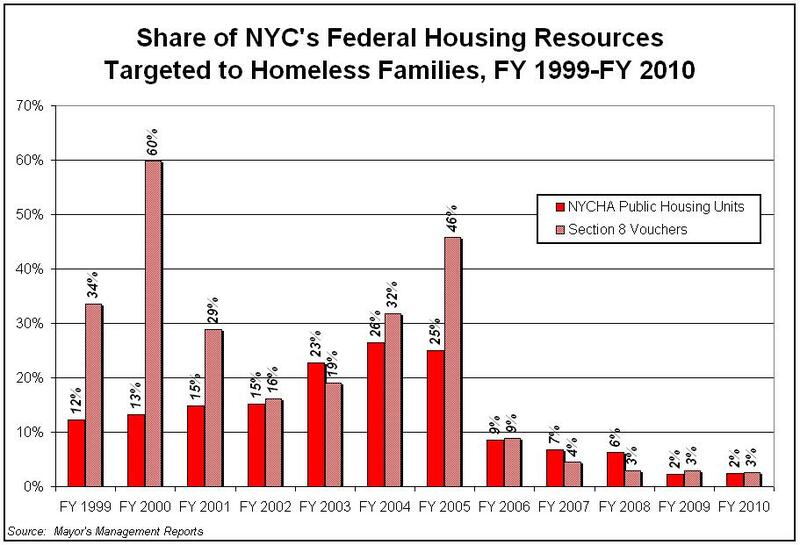 The Federal government has confirmed it: homelessness in New York City has reached record levels. As we reported in this year’s State of the Homeless, the number of men, women, and children experiencing homelessness has reached record levels. In fiscal year 2010, an all-time record 113,553 homeless people slept in the shelter system. And just this week, the Federal government released new data confirming that homelessness worsened significantly between 2009 and 2010 in New York City and State. For instance, the number of homeless families with children in New York City rose by 7.3 percent. A summary of the HUD data can be found here. It’s way past time for the City to implement real solutions. Send a letter to Mayor Bloomberg right now, asking him to use what we know works – permanent, affordable housing – to fight this homelessness crisis he helped create. Under Mayor Bloomberg’s watch, the city ended the cost-efficient and successful policy of giving qualified homeless families priority access to permanent, affordable housing options like public housing and Section 8 vouchers. Instead, the city has used bureaucratic, time-limited programs like “Advantage” that have become a revolving door back to the shelter system for thousands of homeless families. In fact, according to the City’s data, nearly half of the record numbers of people entering shelters last year have been homeless before – almost double the rate before the Mayor put his failed programs in place. Enough is enough. Yesterday we started a new campaign to collect letters to be delivered to Mayor Bloomberg. Help us collect 500 letters by the end of this week! We’re asking him to immediately being using one in three available NYCHA public housing apartments and Section 8 vouchers to help homeless families and individuals move from shelters to permanent housing. This method has been consistently shown to move families out of shelter and keep them stably housed. Moreover, it saves City taxpayers millions of dollars.